Alexei Kudrin, the finance minister in charge of the 2008 financial crash and two-times deputy prime minister, was sacked in September 2011 for overweaning ambition by President Dmitry Medvedev. No Russian politician has ever been cut to size so publicly as Medvedev did it to Kudrin. He has now been chopped again. This time it’s President Vladimir Putin who brought down the axe, four months after Kudrin announced to Bloomberg that he was running for “Top Job in Putin Government”. If Kudrin — Putin told a questioner at his press conference last week — would try harder at being number-2, there will always be a place for him. Putin was asked: is it true that Alexei Kudrin will become head of the Centre for Strategic Research and will prepare a new economic programme? Putin was repeating himself. In November 2013, he had announced: “He will join forces with us, in the presidential expert council, which isn’t too bad either. I expect very much that he will make a lot of useful contributions to our discussions, to our decisions.” For Kudrin it was too bad, so he didn’t. For the archive on Kudrin’s strivings and sackings, start here and go backwards in time. The Expert Council is a tusovka of ranking ministers and special advisors. Its only Marxist economist, Sergei Glazyev (below, left), is hostile to everything Kudrin says and stands for; for this, Glazyev is regularly slapped down in public by other Council members, but they can’t rid the Council of him. Kudrin is already a council member, so if he were to be promoted to deputy chairman, that would mean a demotion for the current deputy chairman, and Putin’s present chief economic advisor, Andrei Belousov (centre). As a consequence of its internal differences, the council has neutralized itself as a policy coordinating body; it is much less than the sum of its parts, and power is exercised by the members outside the council. The Centre for Strategic Research (CSR) ranks even lower. First established in 1999 as garden leave for academics, bankers and officials in between real jobs, the think-tank became controversial in 2014 when its chief executive Mikhail Dmitriev was ousted for being too negative towards government policy, too positive towards Kudrin. His replacement, Vladimir Knyaginin (above, right), was picked for his anonymity and lack of partisanship. For the man who has considered himself prime minister in waiting for fifteen years, and not less than Number-1 in economic policymaking, Putin’s offer of these two places to Kudrin was the final kiss-off. Either Kudrin accepts the “possibility” of the number-2 chair in an organization that is less than number-10 in economic policymaking power, or else. Or else what? 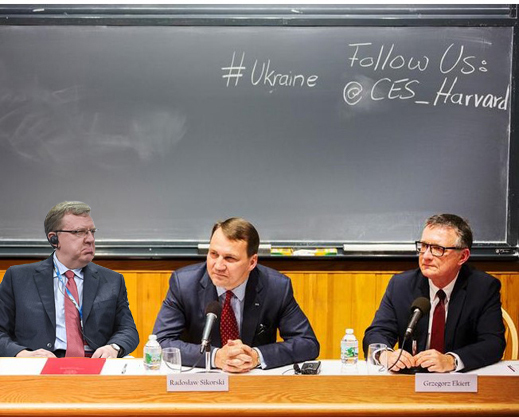 Kudrin is obliged to ask. Lunch with the Financial Times was the recent award for peers like former economic minister of Greece, Iannis Varoufakis; an honorary lectureship at the Minda de Gunzburg Center for European Studies at Harvard is the award for former foreign minister of Poland, Radoslaw Sikorski (below centre); promotion to Washington, then prison in New York, exile in Morocco, and litigation in Paris are the rewards of former French finance minister, Dominique Strauss-Kahn. Can Kudrin (left) hope for better? Kudrin’s spokesmen and media promoters have yet to report what his response is to Putin’s offer. And what about Avis? The advertising idea that if you are No. 2, you are bound to try harder for your customers, started in 1962. It lasted for more than 50 years, and was a success of sorts. In the first year, the campaign reversed the company’s fortunes, helping Avis to go from losing $3.2 million to turning a profit of $1.2 million. But the campaign never succeeded in lifting Avis in the ratings. Right now, it is not only not Number-1 in the rent-a-car business, it isn’t Number-2 either. In 2015 it was no. 3 — behind Enterprise Holdings (Alamo, Enterprise, National) with 1.2 million cars in its fleet, and $13.9 billion in revenues; Hertz with 499,100 cars, $6.4 billion. Avis trails with a fleet of 365,000 and revenues of $5.4 billion. Avis has also changed its pitch to “It’s your space”. That’s exactly what Putin told Kudrin.